Home for the weekend to Stratford-upon-Avon, where I cringe at the local council’s latest Big Idea. A committee of madmen have decided that this precious heritage site should now be known as ‘World-Class Stratford’. And to prove it the council unveils a £3.5 million improvement to a garden area in the town centre. Once lined by mature trees, it’s now a cold expanse of stark new paving stones and stainless steel handrails. I could be in a Milton Keynes skateboard park. I look over at the Royal Shakespeare Theatre (an art deco gem), now gloomily shrouded in scaffolding and ruptured by an enormous concrete obelisk. New aluminium windows have all the architectural appropriateness of pebbledash. It’s a world-class joke. One sympathises. It sounds ghastly. The website promoting it is depressing just for its language alone. And yet, and yet. . . There is something about the phrase “World-class Stratford” that just sounds right to me. The paper is just like TV sometimes – nothing but repeats. So I’m smack dab in the middle. As Derek Smalls almost puts it in Spinal Tap, between the fire of the left and the ice of the right I am “kind of like lukewarm water”. Take the quiz yourself at the link above, and see other NZ bloggers’ results here. I have this theory. It’s called the Stratford Theory of Numbers, and it goes like this: almost every number in a newspaper or magazine is wrong, because it has been misreported and/or misunderstood by the journalist. So the hole was going to be the largest-ever, and slightly smaller than before. Or maybe the same. Whatever. The demise of French cuisine has become a favourite journalistic dish in the past decade, and it doesn't seem to be losing its flavour. Michael Steinberger, an American wine writer, has just published Au Revoir to All That: Food, Wine and the End of France, in which he argues that the one-time gastronomic capital of the world has lost its way. An astonishing fact, that – except it isn’t true. Not even close. There’s a chart here that shows density of McDonalds by country, i.e number of McDonalds restaurants per 10,000 people. (That isn’t quite the same as consumption of Big Macs, but as a proxy it’s close enough.) The US is first, naturally, with 0.433 per 10,000, followed by – ta-dah! – New Zealand with 0.369. Next come Canada (0.352), Australia (0.349) and Japan (0.282). France is a lowly 16th with 0.141. The moral of the story is: beware of journalists bearing statistics. A friend of mine was in Los Angeles 79 thru 87. Michael Jackson had had a huge hit with Off The Wall, and was recording the follow up. The sessions were arranged for a very late start, and, after a night on the town, my mate popped around to the studio to see the producer. It turned out the pile of rags was a gibbering Michael Jackson. They were recording a new song called Billie Jean, and Michael had decided to fill every gap with his trademark whoops, clicks and squeaks. Quincy, however, had decided that the track would be pared down. After several hours of trying to get the singer to do what he wanted, and having consumed large quantities of ragedust, Jones had finally snapped and attacked the poor freak. Needless to say, after the outburst, MJ sang the song how he was told to, and the rest is history. If he’d been any more of a cliche, he’d have been removed from the first draft of his own life by an eagle-eyed editor. She has another go at teachers here. I’ve just discovered her and think she is wonderful. Sort of a cross between our own Cactus Kate and Laughy Kate. And very sound on the BNP. Russia’s energy giant Gazprom has signed a $2.5bn (£1.53bn) deal with Nigeria’s state operated NNPC, to invest in a new joint venture. The new firm, to be called Nigaz, is set to build refineries, pipelines and gas power stations in Nigeria. An obvious and self-selecting name: “Ni” from Nigeria, “gaz” from the Russian for gas. It’s just that, well, it’s a bit rap. 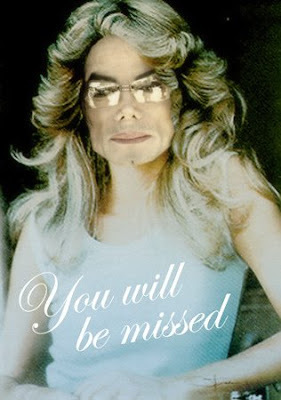 Michael Jackson and Farrah Fawcett R.I.P. This was filmed on 18 June at the Sonar Festival in Barcelona. Fun fact: Grace Jones is 61.
bafflingly conducted by the newspaper’s TV reviewer instead of someone on the political desk. The article is so poorly written it is virtually incomprehensible. Dim-Post lives in Wellington and probably isn’t a regular reader of the Weekend Herald, so doesn’t realise that Hewitson’s interviews are there every Saturday on the back page of the A section. Lucky him, he gets the Post-Dominion so is spared her weekly, weakly unsuccessful attempts at writing like Lynn Barber. Barber uses the first person a lot, but that’s OK because she is interesting. Hewitson also uses the first person a lot. In her 1730-word interview with Goff she uses the first-person pronoun 142 times (56 instances of I, 31 of I’m/I’d, 44 of me and 11 of my). I did the maths: 8.2% of the words in this interview are about Michelle Hewitson. #2 (age five): Whose turn is it first? Me (age middle): When will it be my turn? #2: When we love you. When we start to like you. #2: When we both like him. Jeff Beck, the greatest living electric guitarist, was 65 yesterday our time (24 June), today in Brighton where he is playing in the evening. He was in the Yardbirds in the 1960s, as were Eric Clapton and Jimmy Page, but he’s the only one still pushing the limits of the instrument. And as Home Paddock reminds us, 25 June is George Orwell’s birthday, wherever he is. His complete works are available online here. Actually – slightly off-topic, but does the shipping container/prison idea extend to actually shipping the convicts off to… oh i don’t know… Australia perhaps…? The Herald says that “Act’s flagship three-strikes policy is falling apart, with its format derided even by the hardliners of the crime debate.” This is because of the five-year sentence threshold which “is so high that not even RSA triple-killer William Dwane Bell or samurai sword killer Antonie Ronnie Dixon would have been ‘struck out’ before they committed their notorious murders”. So even the so-called Sensible Sentencing Trust has turned against it. In 1995, a year after Californians voted for a “three strikes and you’re out” law that guaranteed much tougher sentences for criminals who reoffend, Curtis Wilkerson stole a pair of socks that cost $2.50. This is usually counted as a misdemeanour, but a prosecutor in Los Angeles got it classed as a felony. Since Mr Wilkerson had already been convicted of abetting two robberies in 1981, when he was 19, his petty theft was counted as the third strike. He was sentenced to life in prison. He is still there today. I now wonder whether Worth’s crime wasn’t sleaziness; it was his dark blue blazer with brass buttons.
. . . he seemed like a pretty decent guy. A lot of the time when I’m introduced to an MP they quickly realise that I’m nobody of consequence and their eyes desperately scan the room to find someone more profitable to talk to, so I always appreciate it when they do take a minute or so to stop and chat, which is what Worth did. So while it might turn out that Worth secretly drowns Golden Retrievers or lost $2 billion dollars of crown funds at a casino in Macau, at least he’s nice enough to the little people. Speaking of little people, even I once met Worth over lunch, at the Mai Thai, had the same reception and quite liked him. I don’t know what Worth as charged did or didn’t do – the txts as published don’t amount to much – but yes, that blazer with brass buttons he was wearing was a criminal offence. The only useful function of the referendum question is to provide a clue to the mindset that drafted it – subjective, vague, smug and reeking of unexamined, small-minded certainty. Subjective? Check. Vague? Check. Smug? Check. Reeking of unexamined, small-minded certainty? Check. So why hasn’t Baldock been hired as a Sunday Star-Times columnist alongside Macdonald, Michael Laws and Rosemary McLeod? McCartney said going vegetarian, even for just one day a week, was good for the environment because of research suggesting it cuts greenhouse gas emissions from the world’s livestock population. Presumably he thinks that on Mondays all the cows in the world will stop burping and farting. I can see some cows from where I sit and they don’t look the type to take much notice. The five leading markets for Brazil’s enormous beef exports (the country ships more of it than the total of the three next-largest exporters, Australia, Argentina and Uruguay) are Russia, Iran, China, Venezuela and Egypt. So even if consumers in the UK, US and Australia stopped eating beef altogether, there would be vast amounts of the stuff still being eaten. Even a meat-free week would have virtually no effect on greenhouse gas emissions. But that won’t stop them from congratulating themselves that, one day at a time, they are making a difference. Not me. Not you. Not anyone we know. Ishaq, who comes from a poor family that barely survives on the money his father earns from house-painting jobs, had been working at the Orakzai bus stop of the city’s main Terah Bazaar, earning a few rupees a day by helping people to load lorries and buses. Two weeks ago a man with a moustache but no beard approached him and offered him the note to leave a blue plastic bag in a crowded area between several shops. He picked up the bag and pocketed the money, enjoying the feel of it as he thought about whether he might spend it on a rare treat such as an ice-cold Coca-Cola, or take it home to his mother. The bag was of plastic sacking of the type used to carry sugar, and was not heavy. When he woke up he was in Kohat hospital with the other victims of the blast. The 50-rupee note was still in his pocket, covered in blood. Doctors at the hospital say his left foot has multiple fractures and the heel is completely crushed. Yesterday he had the first in a number of operations needed it if he is to walk again. His back is peppered with shrapnel from the bomb but his family has no money for painkillers. I can’t remember what Ramsay actually said that was so outrageous, because I was distracted by that $200 haircut on top of a $20 head. And they will do that how? It’s the theme music. If I have to hear Hello Sailor’s Gutter Black one more fracking time, I swear I’m going to track down Graham Brazier, tie him to a chair, put him in a windowless room with a box of muffins just out of reach and make him listen to his damn song repeatedly for six days straight while the smell of freshly baked walnut, carrot and honey yumyums washes over his face. Let’s see how he likes it then. Except it’s not Graham Brazier’s song. It was written by Dave McArtney and it’s Dave singing. Graham just plays the sax on it. Can’t Stuff afford staff who know stuff? A situation had arisen on one of our farms where the Farm Manager had developed a sexual relationship with a shepherd’s wife. When it came to our notice, the Farm Manager had sacked the shepherd and employed the shepherd’s wife as a casual docking hand. The matter apparently came to a head following a visit to the local pub on a Saturday evening. The shepherd’s wife was in bed, the Farm Manager was disrobing prior to joining her and underneath the bed was the shepherd with a loaded shotgun. The Farm Manager jumped into bed, and in so doing, saved his life. The shepherd discharged the shotgun and instead of killing the Farm Manager, he shot his foot off. We then had a Farm Manager without a foot who couldn’t kick his farm bike over, a shepherd on charges of attempted murder and grievous bodily harm and a casual docking hand who wasn’t officially on the books. The Police had naturally been called and had chalk marks on the floor delineating blood spatters and pieces of bone. Being the country, the neighbours had called to offer assistance. One arrived with his dog which immediately licked up the blood and ran off with the main bone fragment, chased by several policemen. He buried this, creating a problem in the chain of evidence for the Police. Are they hoping someone will throw biscuits over the fence? Apparently not everyone agrees with the jury. 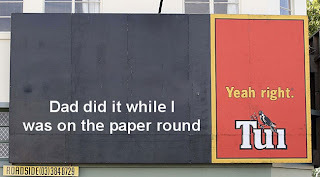 And one else seems to think it odd that a 22-year-old had a paper round. This new foreign limousine has a hot and cold water folding wash-basin of aluminum built into its right front fender. Beneath the hood is a 2-compartment tank holding two and a half gallons of water. The hot water section is heated by exhaust gases passing through a spiral pipe. The two faucets give water of any desired temperature. The basin is automatically emptied when it is folded into the fender. They don’t make cars like they used to. The Auto Union AG exhibited this prototype Horch 930 S at the 1939 Berlin car show. You’d think the designer, manufacturer and model might have had other things on their mind at the time. After 20 years of delay caused by Progressive Enterprises’s endless legal wrangling, the rival supermarket chain Foodstuffs opened its Wairau Park Pak’n’Save store on 3 May. A similar though much lower-profile battle has been fought in Te Awamutu by Progressive’s subsidiary General Distributors. Progressive had the only supermarket in town; Foodstuffs wanted to open one. Cue Progressive again trying to use the Resource Management Act to stop its competitor competing. Now, after a mere four years’ delay in court, Foodstuffs has the go ahead to open a Pak’n’Save and end Progressive’s monopoly. Mayor Alan Livingston said the dragged-out nature of the spat between the supermarket rivals showed major flaws in the Resource Management Act. “This just highlights the shortcomings of the act,” he said. Mr Livingston said it was in General Distributors’ interest to stall the project, because any delay would benefit the Woolworths store. He said even if the legal costs were $1 million over four years it would still be worth the company’s time because its supermarket had a virtual monopoly in the town. None are so arrogantly ignorant as the tree swinging ilk of evolutionism and their sinister missing link of climate change that they try to shackle into our cherished liberty and freedoms. These same paupers of mind would have accepted Marx, or Hitler with his super race answer to planet Earth’s evolution for a 1000 year bliss with all in Utopia. It was Christianity that motivated men like Winston Churchill to rally Western nations under the Magna Carta to vigorously confront a defeat, for our cherished liberty and freedom. This is a freedom that is sadly waning under our cowardly attitudes to not confronting the political correctness of international socialists behind the pagan United Nations and their hoax of climate change for social engineering. • An attempt at world government. An impossible number of Ian McKissack’s missing links (Waikato Times, May 22) won’t solve mankind’s spiritual problems, only the intervention of the Divine. The Ian McKissack to whom he refers is another regular contributor to this delightful series. Whoever the letters editor is must love his job so much. But imagine what the letters they don’t publish must be like. Born 2 June 1857, died 23 February 1934. Much misunderstood as a result of the Pomp and Circumstance marches and all that Proms nonsense, which make him seem like a Colonel Blimp figure, Elgar wrote some magnificent music including two symphonies (the third was completed later by another hand but is well worth hearing), a violin concerto, a string quartet and piano quintet, oratorios such as The Dream of Gerontius, the song cycle Sea Pictures (the words by his wife are much mocked but the Janet Baker version silences criticism), the Enigma Variations yada yada. And also a cello concerto. Here (I can’t get it to embed, sorry) the first movement is played by its most celebrated performer, Jacqueline du Pre. The conductor is Daniel Barenboim; I am not sure who the orchestra is. This really is one of the most powerful openings in all classical music.